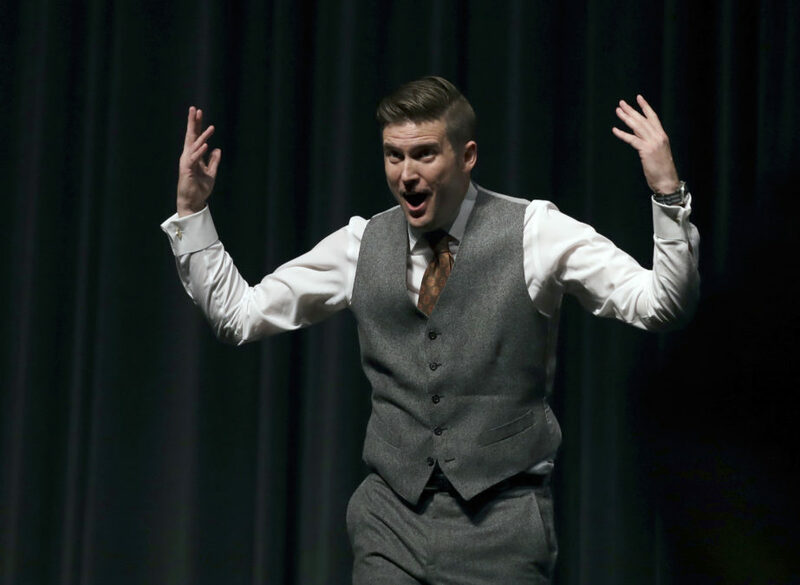 White nationalist Richard Spencer tries to get students to shout louder as they clash during a speech at the University of Florida in Gainesville in 2017. In this week’s roundup: Richard Spencer says the antifa movement is winning; an actual neo-Nazi wins a GOP primary; terror strikes in Austin, Texas; and another gaming platform clamps down on hate. In a late-night YouTube video, Richard Spencer, the de facto leader of the alt-right movement, announced he’s abandoning his shambolic tour of American college campuses. The announcement came after a string of college talks by Spencer at which he was heckled, booed and, in some cases, physically threatened by black-clad protesters affiliated with the antifa, or anti-fascist, movement. “When (these events) become violent clashes and pitched battles, they aren’t fun,” Spencer says in the video. He originally planned his college tour as a way to go into the “belly of the beast,” he said, and confront “Marxist” education at its heart. For a while, Spencer was able to make these appearances without violent opposition. “What changed was Charlottesville,” he says in the video. As the antifa’s presence has grown over the last year, there’s been much debate on the left over the movement’s sometimes violent tactics. Some thought their violence was counterproductive, giving undue sympathy and attention to the alt-right. Others thought it was necessary to keep racists out of their community. Now, with Spencer’s acknowledgement, the debate has become whether the antifa’s tactics – including occasional violence – worked. This debate, however, is unlikely to bother antifa activists. Most members of the movement we’ve talked to couldn’t care less how the media or the general public feel about their tactics. We are in no way ready to “take to the streets.” We have absolutely zero infrastructure. We do not have a huge pool of reliable, competent people. We do not have any stable organizations, we do not have developed communities, we do not have allies in the government or military, we do not have allies in academia, entertainment or media, we do not have a legal team. We do not really have much of anything at all. Capping off the fascist meltdown triumvirate was the news we noted last week that the white nationalist Traditionalist Workers Party has collapsed following a bizarre “love square” (is that a thing?) between the party’s leader and its spokesman, his wife and his stepdaughter. Arthur Jones, a former leader of the American Nazi Party, has won the Republican primary for a congressional seat in Illinois. The state Republican party has disowned Jones. “The Illinois Republican Party and our country have no place for Nazis like Arthur Jones,” state party Chairman Tim Schneider said in a statement. However, the party opened the door for Jones’ victory by not running an official GOP-backed candidate in the heavily Democratic-leaning district in Chicago’s southwestern suburbs. The Illinois GOP reportedly made calls and sent mailers to voters regarding Jones’ racist views. Nevertheless, over 20,000 Republicans cast ballots for Jones. Paul Nehlen, a darling of online white nationalists, is running to unseat House Speaker Paul Ryan in Wisconsin. Sean Donahue, who is a member of the white nationalist American Freedom Party and was convicted of making terror threats against a local district attorney, is running for Congress in Pennsylvania. John Abarr, who claimed his KKK group was opening its doors to nonwhites and the LGBT community, has filed papers to run for the Montana House as a Democrat. The deadly bombing campaign in Austin, Texas, initially targeted some of the city’s prominent African American families. The suspect is now dead, and the 25-minute confession he recorded didn’t reveal a motive. But many in Austin and beyond have labeled the bombings acts of terrorism. The legal definition of terrorism requires a political motive, and it’s still unclear whether Mark Anthony Conditt’s actions fit. But family and friends of the victims are feeling terrorized. Norrell Waynewood, whose brother, Stephan House, was killed by a March 2 mail bomb, told The Daily Beast that his family is living in fear. House’s family has set up a crowdfunding campaign to raise money for House’s daughter. A 33-year-old Oregon Wells Fargo employee was outed as having participated in the deadly Unite the Right rally in Charlottesville. Andrew Alexander Murphy Harkins, who was a mortgage consultant, no longer works for the company. In New York, two teenage boys were charged with a hate crime after leaving threatening voicemails based on the recipients’ religious beliefs. Police did not release details of the insults. In Cincinnati, a 32-year-old man was charged with a hate crime after he stepped outside a restaurant and asked whether anyone within earshot was Jewish. When one man responded, Izmir Koch punched and kicked the man, leaving him with bruised ribs and a fractured eye socket. A Washington man has had a hate crime added to his charges after prosecutors concluded that he rammed an Afghani American man with his car based on racial or religious bias. Perry Nicolopoulos is in jail pending trial. The victim had part of his leg amputated after the attack, which happened in Oregon. A 52-year-old New York man was charged with a hate crime after allegedly yelling slurs at a Latino man and punching and kicking him. Sean Oree is accused of attacking the victim with no provocation. An NAACP chapter in Alabama last week called for hate crime charges to be brought against a white man who shot and killed Lorenzo Freeman, who is African American, in a January road rage incident. Leaders of the group said witness reports suggest that 26-year-old Justin Davidson was shouting racial slurs before he shot Freeman. In New Orleans, 56-year-old Richard Gallegos faces three hate crime counts and three counts of aggravated assault after allegedly pointing a BB gun at a group of people and shouting, “I’m gonna kill all you,” along with a racial slur. In Arizona, two middle-aged women have been charged with burglary and police are considering hate crime charges after they walked into a Phoenix-area mosque and took down leaflets and other literature. The women, Tahnee Gonzales and Elizabeth Dauenhauer, filmed themselves and children who were with them. A Pennsylvania white supremacist was accused this week of offering to target opposing protesters at a rally with a suicide bomb. The charge is part of a broader prosecution of the Aryan Strikeforce. A statue of abolitionist John Brown in Kansas was defaced over the weekend with racial slurs, foul language and swastikas. In California, the Sacramento LGBT Community Center received two letters containing death threats last week. Police are investigating. Blizzard Entertainment, the gaming company behind the massively popular game “Overwatch,” is attempting to push back against alt-right messaging on its platform. As CNET reports, Blizzard is actively discouraging players from posting the image of Pepe, a cartoon frog that’s been adopted as an alt-right icon. The image also is being banned at in-person competitions where fans watch professional esports players compete. Blizzard is just the latest gaming company to crack down on far-right organizing. After we reported that Valve’s online gaming platform Steam had hundreds of user-created groups glorifying school shooters and white supremacy, the company began quietly removing many of those groups. Correction: A previous version of this story gave the wrong name for the brother of Austin bombing victim Stephan House. The brother’s name is Norrell Waynewood. Arthur Jones, a former leader of the American Nazi Party, has won the Republican primary for a congressional seat in Illinois. The state Republican party has disowned Jones. Paul Nehlen, a darling of online white nationalists, is running to unseat House Speaker Paul Ryan in Wisconsin. Sean Donahue, who is a member of the white nationalist American Freedom Party and was convicted of making terror threats against a local district attorney, is running for Congress in Pennsylvania. John Abarr, who claimed his KKK group was opening its doors to nonwhites and the LGBT community, has filed papers to run for the Montana House as a Democrat. The legal definition of terrorism requires a political motive, and it’s still unclear whether Mark Anthony Conditt’s actions fit. But family and friends of the victims are feeling terrorized. Norrell Waynewood, whose brother, Stephan House, was killed by a March 2 mail bomb, told The Daily Beast that his family is living in fear. A 33-year-old Oregon Wells Fargo employee was outed as having participated in the deadly Unite the Right rally in Charlottesville. Andrew Alexander Murphy Harkins, who was a mortgage consultant, no longer works for the company. In New York, two teenage boys were charged with a hate crime after leaving threatening voicemails based on the recipients’ religious beliefs. Police did not release details of the insults. In Cincinnati, a 32-year-old man was charged with a hate crime after he stepped outside a restaurant and asked whether anyone within earshot was Jewish. When one man responded, Izmir Koch punched and kicked the man, leaving him with bruised ribs and a fractured eye socket. A Washington man has had a hate crime added to his charges after prosecutors concluded that he rammed an Afghani American man with his car based on racial or religious bias. Perry Nicolopoulos is in jail pending trial. The victim had part of his leg amputated after the attack, which happened in Oregon. A 52-year-old New York man was charged with a hate crime after allegedly yelling slurs at a Latino man and punching and kicking him. Sean Oree is accused of attacking the victim with no provocation. An NAACP chapter in Alabama last week called for hate crime charges to be brought against a white man who shot and killed Lorenzo Freeman, who is African American, in a January road rage incident. Leaders of the group said witness reports suggest that 26-year-old Justin Davidson was shouting racial slurs before he shot Freeman. In New Orleans, 56-year-old Richard Gallegos faces three hate crime counts and three counts of aggravated assault after allegedly pointing a BB gun at a group of people and shouting, “I’m gonna kill all you,” along with a racial slur. In Arizona, two middle-aged women have been charged with burglary and police are considering hate crime charges after they walked into a Phoenix-area mosque and took down leaflets and other literature. The women, Tahnee Gonzales and Elizabeth Dauenhauer, filmed themselves and children who were with them. A Pennsylvania white supremacist was accused this week of offering to target opposing protesters at a rally with a suicide bomb. The charge is part of a broader prosecution of the Aryan Strikeforce. A statue of abolitionist John Brown in Kansas was defaced over the weekend with racial slurs, foul language and swastikas. In California, the Sacramento LGBT Community Center received two letters containing death threats last week. Police are investigating. Blizzard Entertainment, the gaming company behind the massively popular game “Overwatch,” is attempting to push back against alt-right messaging on its platform. As CNET reports, Blizzard is actively discouraging players from posting the image of Pepe, a cartoon frog that’s been adopted as an alt-right icon. The image also is being banned at in-person competitions where fans watch professional esports players compete.“The Overwatch League discourages the use of symbols and imagery which are associated with or used by hate groups, including Pepe the Frog,” a company spokesman said in a statement to CNET. “At Blizzard Arena, it’s our policy that fan signs comply with this policy. We likewise ask the same of Overwatch League teams and players on their social-media channels.”Blizzard is just the latest gaming company to crack down on far-right organizing. After we reported that Valve’s online gaming platform Steam had hundreds of user-created groups glorifying school shooters and white supremacy, the company began quietly removing many of those groups.